It’s not long ’til Christmas and I’m sure many of you will be busy scribbling your lists for Santa, but don’t put down your pens until you’ve taken a look at these beauties! I came across this range of jewellery whilst perusing online fashion store The Stellar Boutique and immediately thought of a few feminists I know who would love to find one of these in the toe of their stocking. The collection is called ‘Icons’ and comes from an independent designer called CUCA. The designer is a Portugese artist, based in Barcelona, who hand makes each piece using ceramic tiles. She then prints on the image, works over it with glitter and seals it before turning it into a ring, pin brooch or necklace. 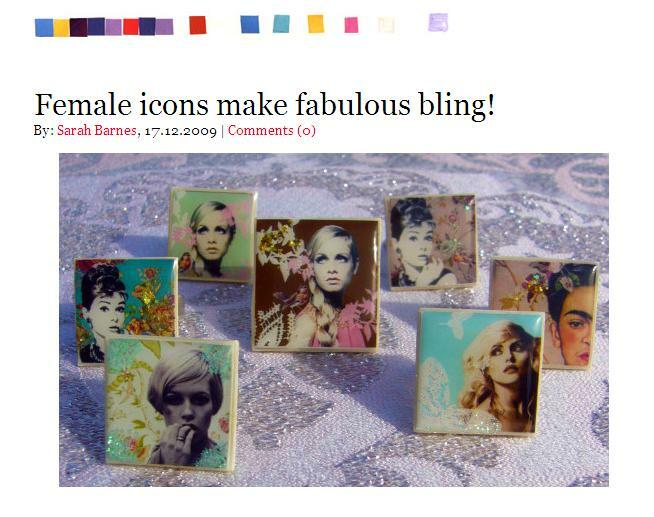 My favourites have to be the Frida Kahlo and Audrey Hepburn pendants, since they are both wonderfully inspirational women and cultural crushes of mine! So, if you’re still stuck for what to buy a special someone why not splash out on one of these unique and original pieces? You’ll be supporting an independent creative and showing your appreciation of a strong female cultural icon. What could be better? Well, they’re all on sale now at The Stellar Boutique, so none of them will set you back more than £25! How’s that for a Happy Chrtistmas?! This entry was posted in Press and tagged Audrey Hepburn, Blondie, fashion, fashion accessories, fashion boutique, fashion online, fashion shop, feminism, frida Kahlo, Jewellery, jewelry, rings, the stellar boutique, twiggy.